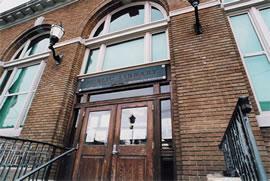 The Hudson City Branch of the Free Public Library of Jersey City was first opened to the public on December 9, 1911, in rented rooms on the south-west corner of Central Avenue and Lincoln Street. It was an immediate success, and the work increased so rapidly that it was soon found that these rooms were inadequate to give the people of the Hudson City section suitable library facilities. So begins the commemorative booklet chronicling the "Hudson City Branch" opening at its present location of 14 Zabriskie Street, which occurred on October 1, 1918. According a news report in The Jersey Journal on October 2, 1918, the formal opening was “attended by a large and enthusiastic audience. American flags and those of the Allies [of World War I] decorated the interior of the new edifice…"Mayor Hague made the opening address, declaring that Hudson City '‘deserved the best and finest library in the city. Mayor Frank Hague’s rhetorical flourish, though par for the day, befitted a branch library that Nelson J. H. Edge, then-president of the Library Board, described as "Some of its many attractions are a complete file of all the newspapers which have been published in the city, also all the Directories; a special room for the blind with books printed in raised letters which they can read; a collection of over 5,000 mounted and unmounted engravings, and a Museum full of interesting objects, including a very valuable collection of over 7,000 gold and silver coins and medals, ancient and modern, the gift of the late Dr. John D. McGill.